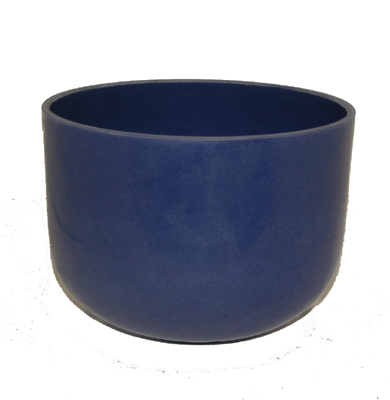 Cobalt is the dark blue Elemental bowl. Sagittarius is the astrological sign associated with cobalt. Cobalt can assist in actualizing creative pursuits, removing self-limiting blocks, and stimulating the imagination. Cobalt can lift the mood, and during contemplation help to maintain a state of grace and inner peace. Cobalt stimulates third eye visioning and lends itself to being programmed for clairvoyant purposes. Cobalt is known to assist in the treatment of cellular disorders. It is also a spiritual mineral that nurtures imagination and personal power. It's striking deep blue color makes it a stone of communication, and exploration of new learning experiences. Cobalt as a colour transitions from the blue to the violet ray, making this an effective meditation crystal for those who are seeking deeper spiritual understanding. Currently available in 9 inch , Note G, Throat.